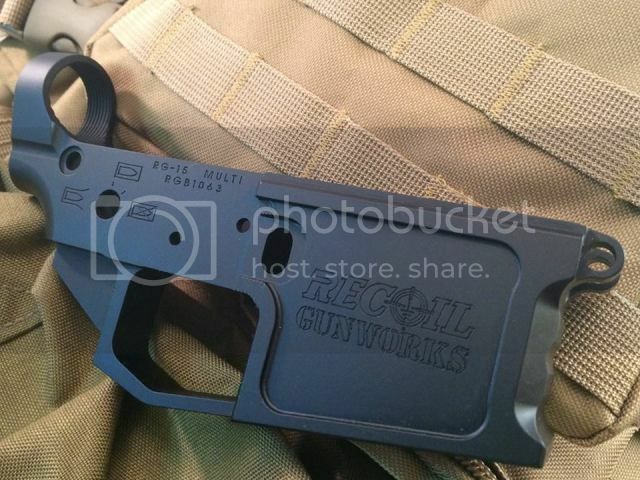 Introducing the Recoil Gunworks RG-15 Billet Lower Receiver. These are quality billet lowers offered at the price point closer to forged lowers! This is the perfect starting point for you next build. One of the best features is the threaded bolt catch pin hole. No more frustration, or scratches on your receiver, from trying to drive in the bolt catch roll pin. Simply screw in the provided pin. This will be the easiest lower you have ever built! The finish on these lowers is a very nice deep black. Left Side Safety Selector hole notched to accept BAD_ASS ST 45 degree short throw lever if desired. Compatible with all Lower Parts Kits, Mil-Spec or Commercial receiver extensions (buffer tubes), and most other aftermarket parts. For $119 I decided to take a chance on a small company from across the river. "Blown away" doesn't even cover how impressed I am with Recoil's build quality and customer service. For less than what some companies charge for a forged lower, you can build your next rifle on a rugged, sleek billet lower instead. Fit and finish are very, very good and tolerances were all well within spec. Mated up perfectly with an Aero upper I had. Let's also talk about not only the tapped 4-40 hole for the rear detent spring, but the bolt catch. Everyone who's built an AR knows about flying detents and the big oopsie scratch from driving in the bolt release pin. Not this time. With a small allen wrench, you're in beeswax with no hassles. Though the Magpul BAD lever does not work, the Phase 5 does, albeit tightly. There's no question I will recommend Recoil's lower. I've had more than a few people ask me about it at the range and I'm happy to spread the word. Keep it up, Recoil - great products and customer service and a price you can't say no to. I'll be back the next time the builder bug comes biting.